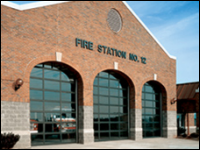 Overhead Door of Mentor offers a comprehensive line of sectional steel doors, Thermacore® doors and commercial aluminum doors. We cover sales, installation, and repair of industrial sectional steel doors and aluminum doors. Our insulated steel products are one of the industry’s most complete selection of panel profiles, gauges, track styles and hardware for commercial sectional door systems. We have a large line of insulated and non-insulated sectional doors. We have the solution for your commercial dock door needs.